In 2018, the UFC crowned two champ-champs, as Daniel Cormier and Amanda Nunes each moved up a weight class and claimed a second belt. This weekend, 135-pound king T.J. Dillashaw will move down in weight to challenge Henry Cejudo for the Flyweight Title. For the first time, a UFC fighter will move down in weight for a shot to become a simultaneous two-division champion. The Co-Main event will see a former NFL player, Greg Hardy make his debut inside the Octagon this weekend. Henry ‘The Messenger’ Cejudo, an Olympic gold medallist in wrestling is coming off a career-defining win by dethroning former champion Demetrious Johnson at UFC 227 back in August of 2018. “The Messenger”, has won three fights in a row while growing in stature each time he gets inside the Octagon. Henry Cejudo holds a slight grappling advantage over his opponent along with powerful wrestling abilities. 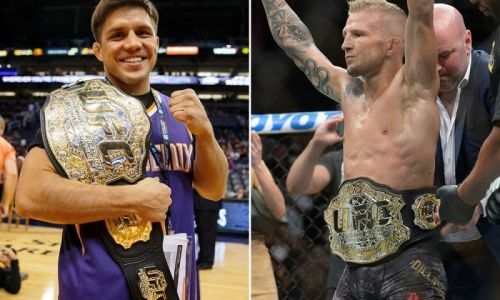 To make his first successful title defence, Cejudo will have to beat one of the best pound-for-pound fighters in the sport when he takes on TJ Dillashaw this weekend. T.J. Dillashaw steps down a weight class to take on flyweight champion Henry Cejudo for the 125-pound title. An elite Bantamweight for several years and now legacy-chasing TJ Dillashaw aims to be the best and not just UFC’s next double-division champion. He enters the contest with back-to-back knockout wins over former champion Cody Garbrandt. Dillashaw has a big spotlight on him after he cut down to 125 pounds to fight in the flyweight division. MMA fighter Greg Hardy is a former American Football player who was in the news for all of the wrong reasons in the recent years. Charges of domestic violence and a raft of media attention has not deterred the 265-pound 30-year old from his goal of making a big name for himself in mixed martial arts. He will make his UFC debut after just three professional fights while amassing a 3-0 record with all his wins coming by way of first-round knockout. As a natural athlete, Hardy has all the tools to become a top-flight heavyweight but he is yet to be tested on the canvas and hasn’t had a long fight to test his stamina. Allen Crowder, who didn’t fight at all in 2018, will return to the Octagon against a controversial figure this weekend. Allen Crowder enters this fight with a 9-3 record and has won 56 percent of his fights by knockout.